Wood and bread aromas take us back to the story of a fascinating place that over 140 years ago revealed its rich deposits of copper. Foreign companies made arrangements to have a franchise and operate its mines, however “El Boleo” was a French company, who obtained the greatest benefit. The Mexican government, then under the command of General Porfirio Diaz, granted them in 1885, permission to operate these mines for 99 years; that’s when the actual migration to the territory of entire families from the Gallic country started. Their customs and architecture also migrated, Santa Rosalia was built with a Mexican-French style, but definitely inspired by the french mining towns of nineteenth-century. All over the place a European flavor is scented. Buildings, hotels and shops still have the unique style. 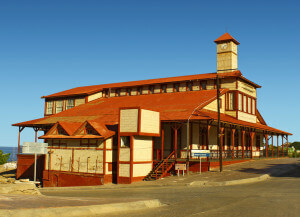 The famous “French Hotel” built by the mining company in 1886, the building of the “Mining Museum”, the “City Hall”, “Post office”, “the French Bakery” and the “Church of Santa Barbara” stand out. The design of some of these have been attributed to Gustave Eiffel, especially the Church that was built on a metal base. It is said that in 1889 was exhibited along with the Eiffel Tower in Paris. 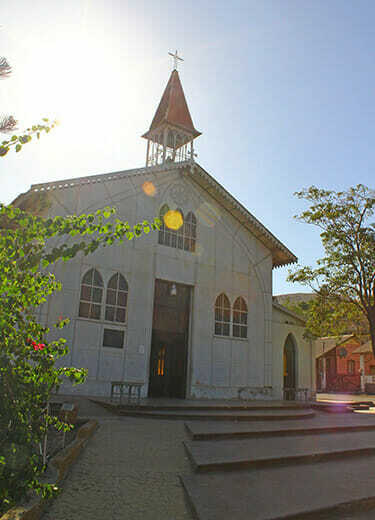 The story also tells that the company El Boleo took the necessary steps to buy the church, giving pleasure to the community of Santa Rosalia who did not have one. Outside the building is a plaque which gives Gustave Eiffel credit as its creator. 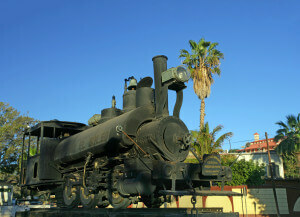 In the characteristic Morelos garden, are now exhibited the steam locomotives thet were used to pull carts full of metal extracted from the mines. With a fascinating historical charm, Santa Rosalia is a gem appreciated by all visitors. A 63 km northwest of Mulege and 555 Kms. north of La Paz. Is located on two plateaus that separates a stream. Ferry which connects to Santa Rosalia to Guaymas, Sonora. Transpeninsular road that connects Tijuana, BC and Los Cabos, B.C.S. Loreto International Airport is the nearest airport, 197 km south. The Palo Verde Airport, 30km, flies to the city of Guaymas and Hermosillo.